This edition reprints three short historical sketches Judge Agnew originally published in 1893 and 1894. 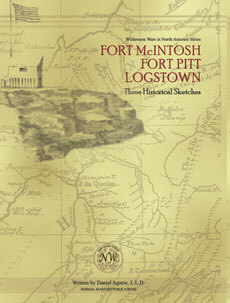 The first, Fort McIntosh: Its Times and Men, provides a history of Fort McIntosh as well as information related to Fort Pitt during the later years of War of American Independence. The second essay, “Fort Pitt” and Its Times, covers aspects of the history of Fort Pitt not contained in the earlier work. The third work, “Logstown” on the Ohio, is a history of white relations with the Native American inhabitants of the village of Logstown, an important trading center during the 1740s and 1750s. The Honorable Daniel Agnew (1809-1902) was one of the earliest residents of Beaver, Pennsylvania. Born in Trenton, New Jersey, his family moved to Pennsylvania when he was still young. He graduated from Western University in Pittsburgh in 1825 and began to practice law. Agnew moved to Beaver in 1829. He became a member of the Whig Party and was appointed a judge in the 17th Judicial circuit in 1851. Agnew then served as Chief Justice of Pennsylvania from 1863-1878. After his retirement, he returned to Beaver, where he spent most of the remainder of life in the pursuit of local history.